Most visitors who come to Rome look forward to admiring the historic Trevi Fountain and partake in the coin-tossing tradition. However, for almost 2 years this famous Baroque fountain will be under restoration and it will affect how you see and visit the fountain. 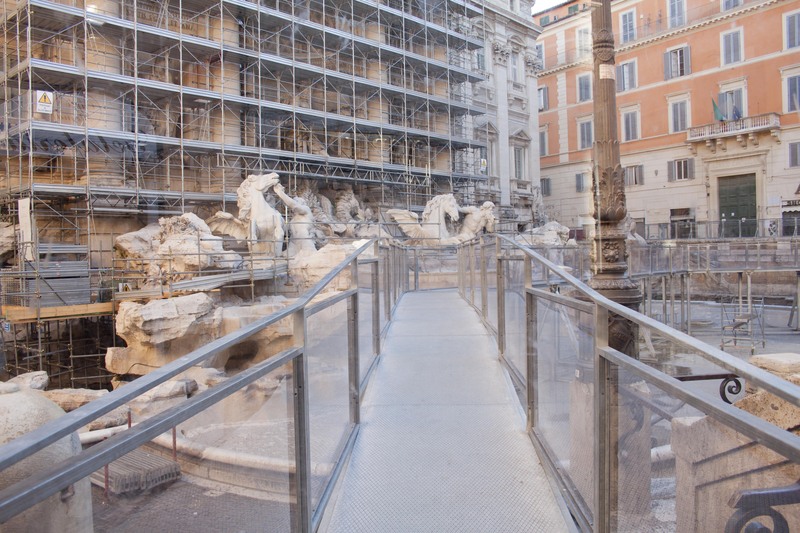 Here are some Frequently Asked Questions about the Trevi Fountain Restoration. 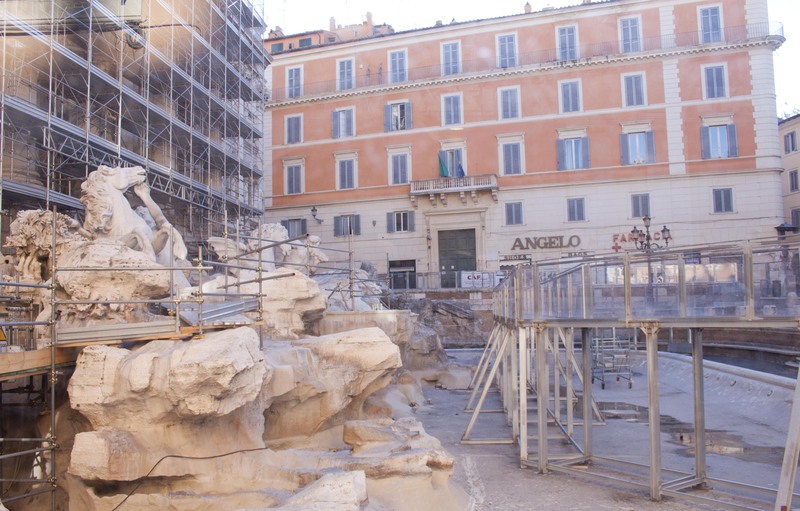 HOW LONG WILL THE RESTORATION OF TREVI FOUNTAIN TAKE? 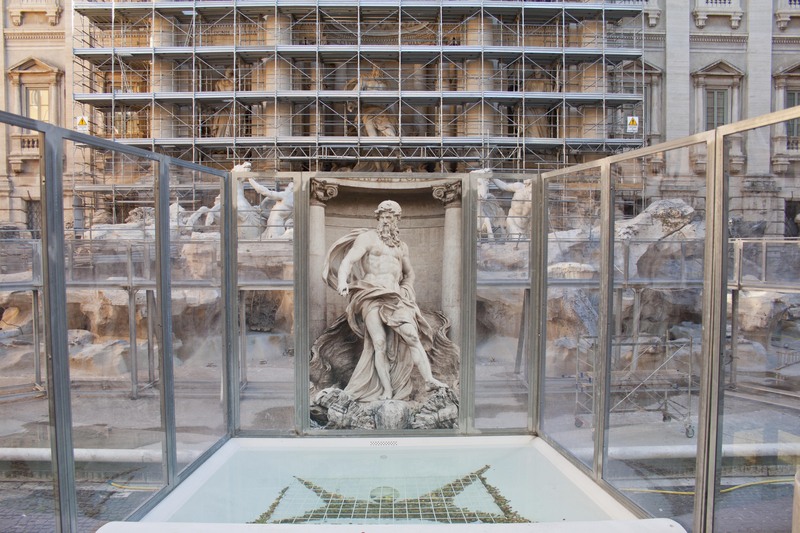 Between July 2014 and Fall 2015 the Trevi Fountain is undergoing restoration that includes cleaning of the travertine stones and marble sculptures, water proofing the basic, and other repairs and touch ups that ensures future generations will be able to enjoy this precious monument. WHO PAID FOR THE TREVI FOUNTAIN RESTORATION? 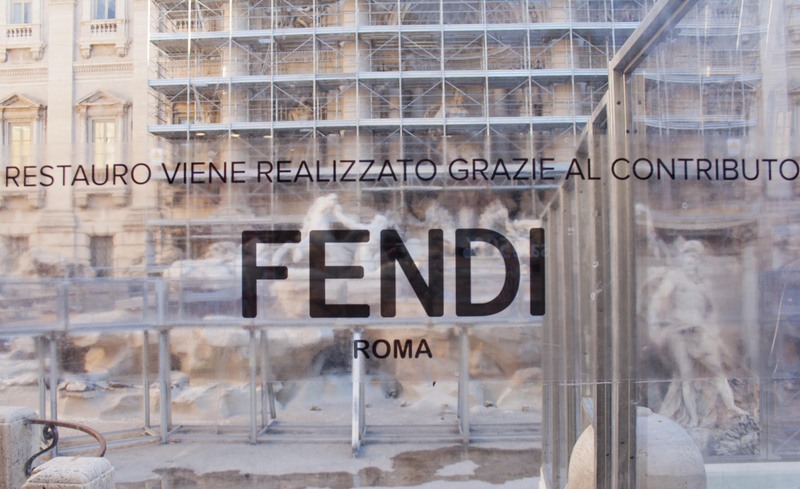 The restoration project may not have been able to take place if not for the generous sponsorship by Italian fashion house FENDI, who donated nearly 3 Million Euros in its “Fendi for Fountains” initiative that helps restore Italy’s cultural heritage. WHAT DO YOU EXPECT TO SEE DURING THE RESTORATION PROCESS? During the restoration process the fountain will be sealed off surrounded by a see through wall so visitors can see the restoration process taking place. The fountain basin was emptied and no water is running during the restoration. The back of the fountain against the side of the building is currently covered with scaffolding (and reported that the scaffolding would be covered by a shield printed with an image of the fountain to cover the scaffolding eye sore). Two TV Screens placed on top of the see through screen (as seen in the photo below) play videos of the fountain restoration process as well as historic footage. DO PEOPLE HAVE ACCESS BEYOND THE SEE THROUGH SCREEN? Generally the fountain is sealed off during the restoration works. However, a suspended walkway was installed across the now empty basin so visitors can see the statues up close (before not possible due to the water basin). In the afternoon an otherwise closed off entry door is opened so people can, in single file, enter inside and walk on the suspended bridge to get a close up view of the works and the statues. WHERE AND HOW DO YOU TOSS THE COINS IN THE TREVI FOUNTAIN? Tradition has it that if you toss a coin over your shoulder into the Trevi Fountain, it will ensure a return to the Eternal City. But with the Trevi Fountain drained and sealed off, how can people continue the coin tossing tradition? In the front center of the fountain, there is an installation with a small basin of water and a backdrop of Oceanus so visitors can have the pleasure to toss their coin and the backdrop image makes for a more pleasing photo. We hope this information helps answer some of the most frequently asked questions about the restoration of the fountain. 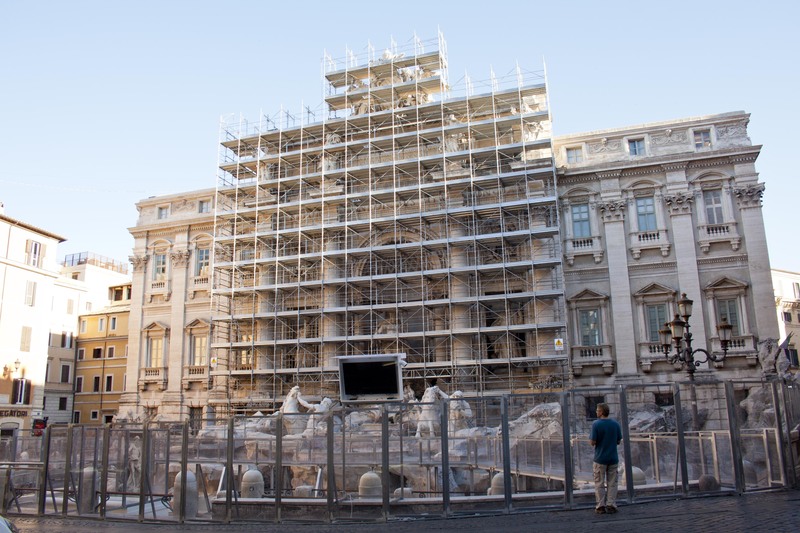 Follow this blog for updates on the Trevi Fountain Restoration as well as photos of the progress. If YOU have any questions please don’t hesitate to ask in the comment box below. To visit the Rome Cabs official website please log on www.RomeCabs.com, the one and only website for Rome Cabs Limousine Company. Click for For Private Day Tours of Rome with Rome Cabs. Click for Private Shore Excursions of Rome from the cruise port of Civitavecchia. Click for Private Tours in Italy with Rome Cabs. Thank you very much and please come back and visit our photo blog soon!